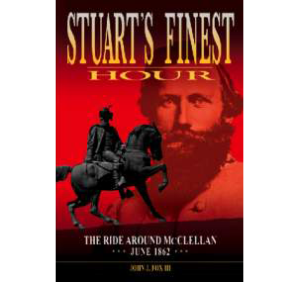 Stuart’s Finest Hour: The Ride Around McClellan, June 1862 is ready as an E-Book at KINDLE and NOOK. Stuart’s Finest Hour is also available on I-TUNES. 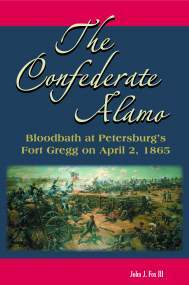 The Confederate Alamo: Bloodbath at Petersburg’s Ft. Gregg is available in KINDLE and NOOK. Many thanks to Savas Beatie Historical Publishers for their help making these award-winning books possible! May 2014 will ring in the 10th anniversary of the publication of my first book which details the long bloody road of the 35th Georgia Infantry Regiment during the American Civil War. 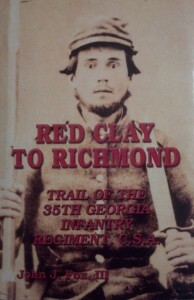 It is hard to believe that Red Clay to Richmond: Trail of the 35th Georgia Infantry Regiment came out ten years ago. Little did I know that a 1987 visit to a frame shop owned by Columbus, Georgia’s Jack and Dian Stroud would launch my Civil War writing path. The Stroud’s framed a Don Troiani print that I had purchased titled “Show Them the Cold Steel Boys!” which portrayed a wild-eyed Brigadier General Lewis Armistead leading his Virginia Brigade over the stonewall and into the muzzles of Union cannon at Gettysburg. Before I left the shop on that fateful day, Dian showed me a framed original letter that a Confederate relative had written. Imagine my surprise when Dian told me that her Aunt Ruby had two shoe boxes of letters written by Private James Marion Garrett to his widowed Mother. I asked, and almost insisted, that these letters needed to be copied and preserved. With my Army background, a history degree from Washington & Lee University and a love for all things Civil War I convinced myself that I was the person to do this. I must have convinced Dian who then convinced Aunt Ruby because several weeks later Dian called to say that she had the letters at the shop if I wanted to come see them. I raced back to the shop and soon held these letters written by a young eighteen-year-old Private James Garrett to his Mom. They spanned from 1861 until 1864 and highlighted Garrett’s experience through all the major fighting in Virginia, Maryland and Pennsylvania. The letters revealed the daily trials and tribulations of a Confederate foot soldier both in combat and in camp – from the euphoric high of finding extra food to the low of lows as Garrett scribbled about the death of a good friend. 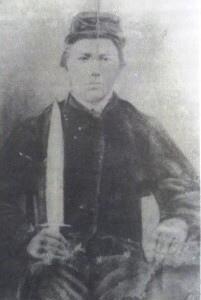 Private James Marion Garrett, Company D, 35th Georgia Infantry Regt. And then in May 1864, after the fiery fighting at The Wilderness, fate caught up with the young Georgian. Early on May 12, two Confederate brigades led by brigadier generals Edward Thomas and Alfred Scales’ rushed through the dense woods on the east side of the now famous Mule Shoe salient to help Brigadier General James Lane’s Brigade. 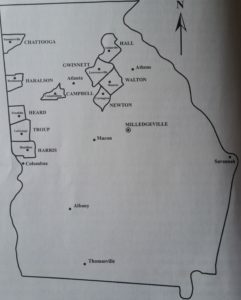 Union fire into both flanks from Second and Ninth Corps units had pinned down Lane’s North Carolinians. The sudden arrival of Rebel reinforcements pushed back troops from Union Brigadier General Robert B. Potter’s division assigned to Ambrose Burnsides’ Ninth Corps. Thomas’ excited Georgians, which included the 35th Georgia and Garrett, chased the retreating blue-clad attackers down a steep wooded hill and across a boggy marsh. North Carolinians and Georgians hugged the ground for about two hours as they endured the murderous fire from Burnside’s men. When the Georgians found their right flank turned they hustled “back across the boggy morass and up the steep incline.” The many wounded Southerners remained behind including Garrett. The 35th Georgia’s sergeant major James P. Johnston noted in a letter to Garrett’s mother that “as soon as night came the ambulance corps found him and carried him to the field hospital.” Garrett hung on in the hospital for three days. A good friend, Sergeant Wilson J. Moore, maintained a bedside vigil and wrote to Mrs. Garrett that her son had left a small pocket book and an ambrotype to be sent home. Moore also noted James’ generosity because he always shared food that the Garrett family had sent from Georgia. Chaplain John H. Taylor spent much time at the bedside of James Garrett before the young Georgia soldier died. Taylor wrote Mrs. Garrett a letter describing her son’s faith and resolve during his final hours. you, I remain your humble servant. A burial detail placed the body of twenty-one-year-old Private James M. Garrett into the ground near the field hospital on May 15, 1864. Several years later, the numerous bodies buried near this spot were removed to Spotsylvania Confederate Cemetery. However, Mrs. Garrett never learned the exact burial location of her son’s body. Then in the mid-1990s I talked with Keith Bohannon who was doing some work for the NPS at Fredericksburg-Spotsylvania Military Park. 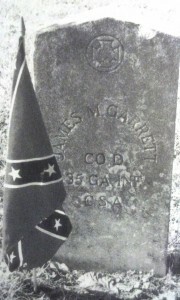 Keith soon located young James Garrett’s grave and he sent me a photo of the headstone. Jack and Dian Stroud, Aunt Ruby, the extended Garrett Family and I all finally had an answer to a more than 130-year family mystery.